The author is a specialist on China’s economy – having written over 200 articles on it, published in English, Chinese, Spanish, Portuguese, French and Russian over a 26-year period. 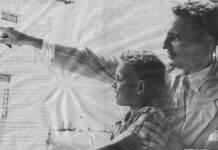 He was directly involved in some economic discussion in Venezuela during the period of Chavez, including directly with President Chavez (articles related to this in Spanish and English may be found at http://thevenezuelaneconomy.blogspot.com/). However, the author has insufficient knowledge of the detailed situation in all Latin American countries. and this article does not deal with directly political issues. This article therefore only deals with certain key economic issues which can be clearly seen both in the trends in Latin America and in comparison, to Asian countries – particularly China. It is therefore circulated for discussion in the expectation of inevitable criticism and improvement – these are greatly welcome. Recent events in Latin America entirely refute the claim in the Western media that the right wing was carrying all before it in the continent. Certainly, the right wing in Latin America is strongly coordinated by outside forces, and the left in Latin America does not have the same advantages in easy unification and coordinated – despite the great successes and achievements of the ‘pink tide’ at the beginning of the century. But the reality is that both the right and the left have very deep social roots in Latin America and that there will be a prolonged period of struggle between them. To take simply some recent key events. The election of the new left President of Mexico, Andrés Manuel López Obrador, popularly known as AMLO, is an important advance for the whole left internationally, especially in the Americas. Polls show that in Brazil Lula would win the Presidential election – which is why a fraudulent state policy is being carried out to imprison him and ban him from the election. 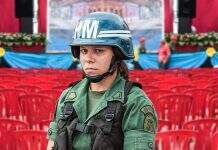 A new economic crisis in Argentina has forced its neo-liberal government to humiliatingly go to the IMF – discrediting it and launching a new round of social struggles. Lula blocked from running for president in Brazil – as already analysed. In Argentina former left President Cristina Fernández de Kirchner has been charged with treason, a crime punishable by 10 to 25 years in prison. The right-wing government, in office since 2015, was already unpopular before it signed a bailout deal with the IMF and its support is expected to further decline. 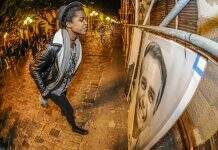 Kirchner would be a strong candidate for next year’s Presidential election, so the aim is to block her from running. In Bolivia Evo Morales was elected President in December 2005 and has been re-elected to office ever since. The Bolivian economy has grown in every year since Morales was elected with the total expansion of per capita GDP up to the end of 2017 during his term being 46% with an annual average growth rate of per capita GDP of 3.2%. In November 2006 Daniel Ortega was elected President of Nicaragua and has been re-elected to office since. The Nicaraguan economy has grown in every year since Ortega was elected with the exception of 2009 when it was hit by the international financial crisis. 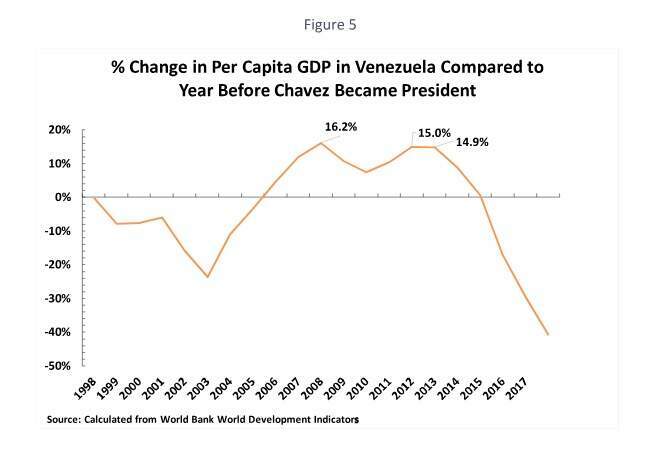 The total expansion of per capita GDP up to the end of 2017 during Ortega’s turn in office has been 38% with an annual average growth rate of per capita GDP of 3.0%. Consumption which, by definition, is not an input into production – Department 2 of the economy in Marxist terms. 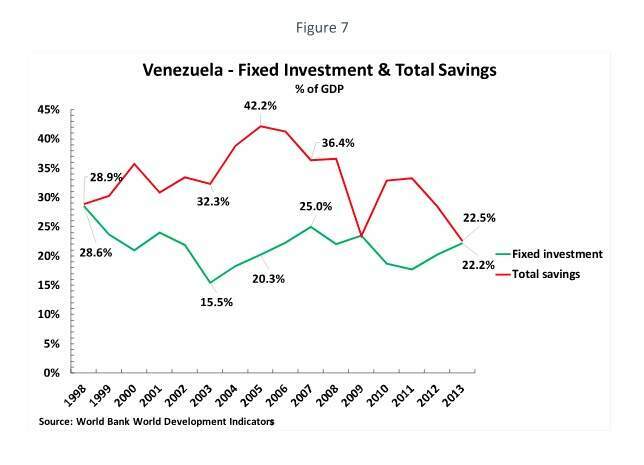 The percentage of fixed investment in Bolivia’s GDP rose from 14.3% to 20.8%. 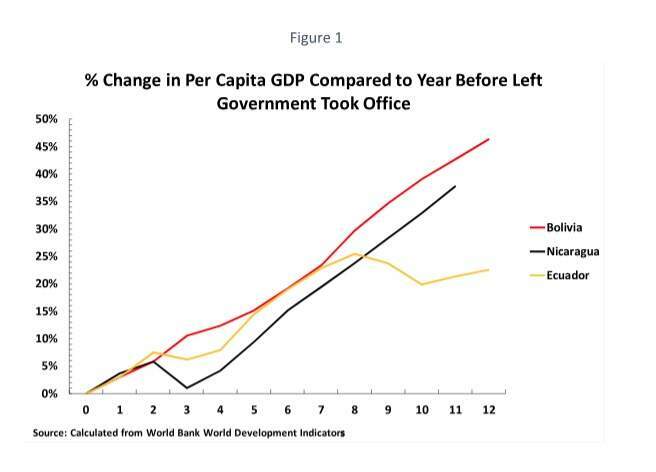 The percentage of fixed investment in Nicaragua’s GDP rose from 24.9% to 30.1%. Annual per capita GDP growth during the past decade (2006–16) was 1.5%, as compared to 0.6% over the prior 26 years. 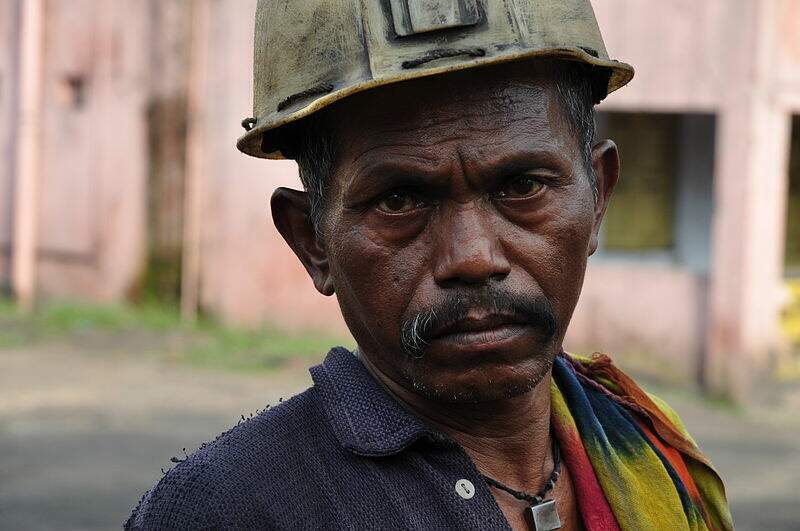 The poverty rate declined by 38%, and extreme poverty by 47% percent. The reduction in poverty was many times larger than that of the previous decade. Inequality fell substantially, as measured by the Gini coefficient (from 0.55 to 0.47). The government doubled social spending, as a percentage of GDP, from 4.3% in 2006 to 8.6% in 2016. Public investment increased from 4% of GDP in 2006 to 14.8% in 2013, before falling to about 10% of GDP in 2016. In 2015-2016, in addition to problems created by the increase in the exchange rate of the dollar, with no ability to devalue, Ecuador was struck by severe natural disasters such as the eruption of the Cotopaxi volcano and the El Nino phenomenon and, most substantially, the severe earthquake, which killed least 676 people with over 16,600 injured and which by itself had a negative impact of 0.7% on GDP. 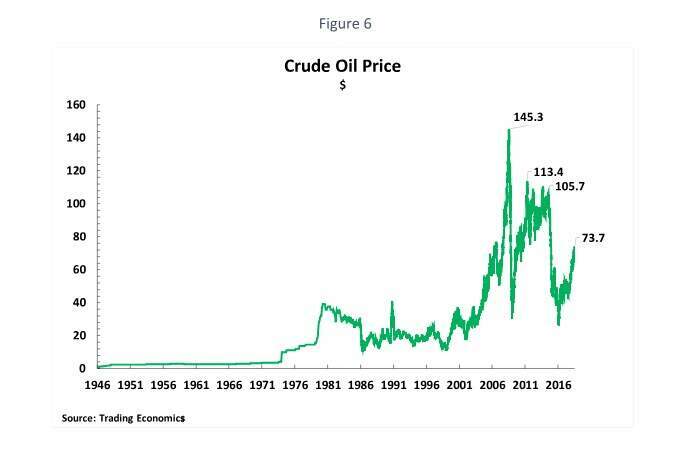 This led to the necessity in the short term to devote more of the economy to consumption, in order to maintain the population’s living standards, but there was no confusion on the fundamental strategy of increasing the level of investment in the economy. This simply tactical shift was politically successful in ensuring the election of the candidate of the Alianza País in the 2017 Presidential election. Lula was elected president of Brazil in October 2002. He was succeeded in 2011 by Dilma Rousseff who won re-election in 2014 until being removed from office by a fraudulent ‘constitutional coup d’etat’ in August 2016 – with Temer becoming president, whose current approval rating is 4%. Néstor Kirchner became Argentina’s president in May 2003. He was succeeded by Cristina Fernández de Kirchner who remained in office until the right winger Macri was elected president in December 2015. 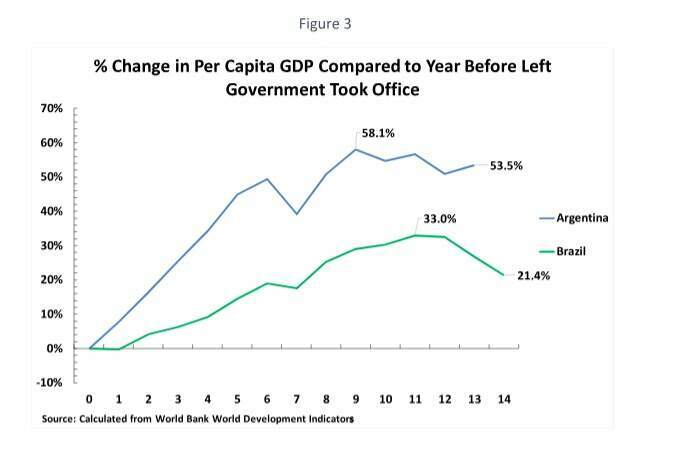 In Brazil, under the left government, the economy grew steadily until 2013. Per capita GDP in 2002-2013 rose by 33%, an annual average 2.6%. However, from 2014-2016 Brazil’s per capita GDP fell sharply by 9%. In Argentina per capita GDP grew by 58% from 2002-2011 – an annual average 5.2%. However, after 2011 GDP growth stalled and by 2015 per capita GDP had fallen by 3% compared to 2011. 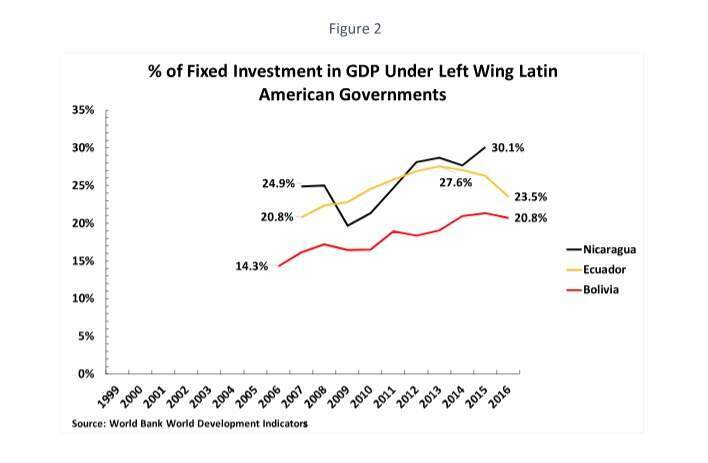 In Brazil the percentage of fixed investment in in GDP did rise significantly from 2003 to 2013 – from 16.6% of GDP in 2003 to 20.9% of GDP in 2013. However, from 2014 onwards it was allowed to fall, dropping to 16.4% of GDP by 2016. 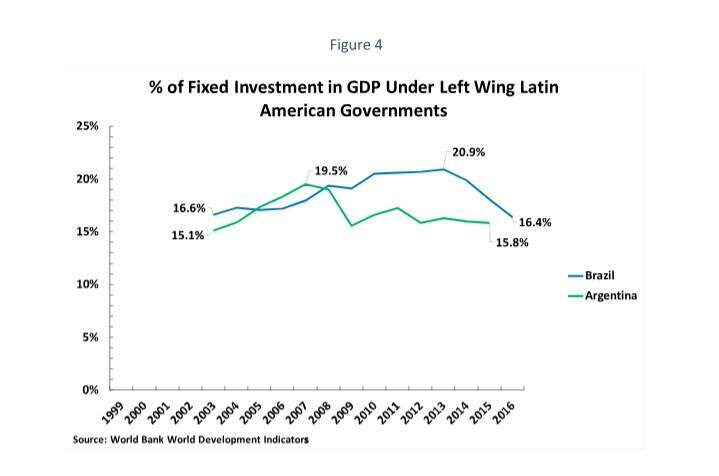 In Argentina the increase in fixed investment was shorter lived than in Brazil– from 15.1% of GDP in 2002 to 19.5% of GDP in 2007, before falling to 15.8% of GDP in 2015. In the almost 40 years since the beginning of China’s economic reform China’s economy has grown every year without exception. Its annual average increase in per capita GDP has increased by 8.4% a year over the 39-year period from 1978-2017. 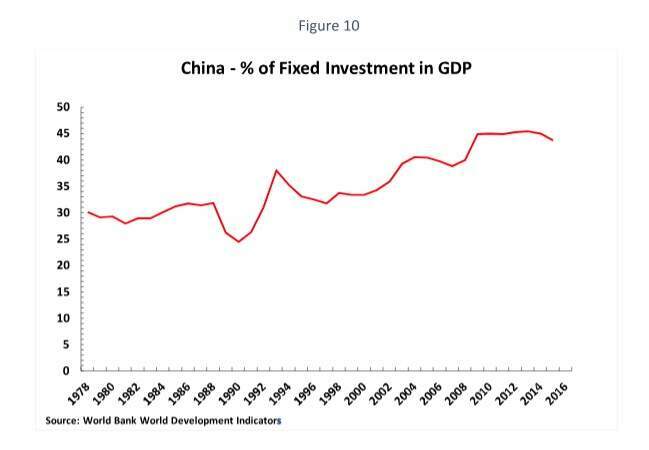 China experienced no serious economic crisis following the international financial crisis beginning in 2008. 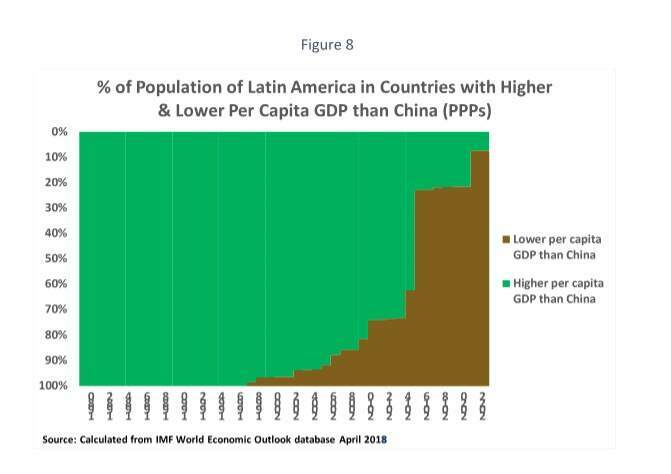 In 1980 100% of the population of Latin America lived in countries with a higher per capita GDP than China. 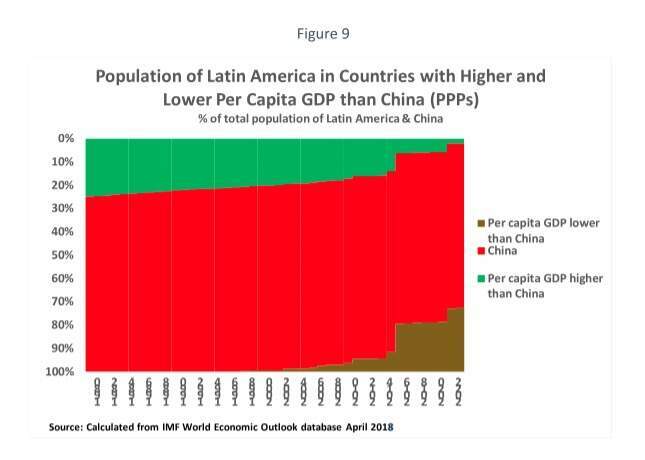 By 2017 only 23% of the population of Latin America lived in countries with a higher per capita GDP than China and 77% lived in countries with a lower per capita GDP than China. By 2023, on IMF projections, only 7% of the population of Latin America will live in countries with a higher per capita GDP than China and 93% will live in countries with a lower per capita GDP than China. Liked the article? 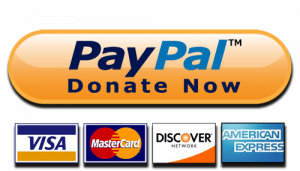 Donate now and help us build counter-hegemonic thinking! John Ross is a Senior Fellow of the Chongyang Institute for Financial Studies of the Renmin University of China. He publishes his articles in the website "Learning from China".